The field of pediatric cardiology has made remarkable progress in the care of children with congenital heart disease. In the United States, the services provided by cardiologists have become highly specialized, necessitating advanced subspecialty training. Along with this evolution was a recent shift in medical education that focuses on a new framework of competency-based training. In 2015, the training guidelines for pediatric cardiology fellowship were revised to meet the standards set by the Accreditation Council for Graduate Medical Education. There were eight task force documents delineating the training guidelines for the various subspecialties. After completion of a 3-year fellowship, qualifying fellows are eligible to take the board examination for pediatric cardiology. The American Board of Pediatrics maintains the process for initial and subsequent pediatric cardiology certification. In the United States, the challenge for graduating fellows to find suitable positions after completion of training is now greater than in the previous years. To assess this situation, a workforce survey was performed which showed that the field of pediatric cardiology is highly competitive and that maintaining the current number of fellowship positions in the United States was advisable. More than half of the fellows pursued additional subspecialty training after completion of the standard 3-year core fellowship. To highlight the recent changes in the medical education, training guidelines, and work environment in pediatric cardiology, we described the fellowship program at the Children’s Hospital of Michigan, including the key components, such as training rotation schedule, educational programs, and committees. The field of pediatric cardiology has evolved significantly over the last two decades and has greatly improved the survival rate of children with congenital heart disease. Advancements in technology have led to new approaches and development of medical devices, opening a new era of pediatric cardiology. With increased medical complexity, pediatric cardiology has branched out into multiple areas of subspecialty. In the United States, medical education and training in general have undergone substantial changes, which are related, in part, to advancements in pediatric cardiology services. To keep up with these changes and further workforce needs, the number of trainees considerably increased over the last decade. In 2015, the training guidelines for pediatric cardiology fellowship program were updated and replaced the original document of 2005. In this review of the status of the pediatric cardiology training in the United States, we cover the updated training guidelines, the process of pediatric cardiology board certification by the American Board of Pediatrics, the summary of the United States Pediatric Cardiology 2015 Workforce Assessment, and a brief introduction to the Society of Pediatric Cardiology Training Program Directors (SPCTPD). Additionally, the pediatric cardiology fellowship education program at the Children’s Hospital of Michigan (CHM) was described as a model for medium-sized training programs in the United States. The new guidelines are a revision of the original training guidelines published in 2005.1） Recently, medical education has undergone changes that were driven by the Accreditation Council for Graduate Medical Education (ACGME), which is an organization that sets standards for compliance by the graduate and medical education programs in the United States. The ACGME developed outcome-based milestones as a framework for determining trainees’ performance based on the six ACGME core competencies. The 2015 training guidelines delineated these six core competencies and the evaluation tools relevant to all pediatric cardiology training (Table 1).1） Previously, trainees were evaluated based on their duration of subspecialty service rotation or the number of procedures they performed. Instead, this new approach requires trainees to achieve an expected level of competency in area of training. For fellowship programs, the performance and evaluation of trainees need to be reviewed by the newly developed Clinical Competency Committees which reports to the Program Director on whether each fellow meets the requirements to move on to each subsequent year of training and then graduation. At the same time, the American Board of Pediatrics (ABP) has directed the use of entrustable professional activities (EPAs) as an observable and measurable framework to evaluate a fellow’s ability to independently practice fundamental professional work. EPAs guide trainees to competencies and milestones across the training landscape of physician activity from medical school to a career of practice. For each EPA, there are five levels of entrustment (Table 2).1） With the close collaboration between the ACGME and the ABP, the EPAs pertaining to all pediatric subspecialties and those specific to pediatric cardiology have been identified (Table 2). Fellows need to acquire at least level 4 expertise in the core curriculum before they complete the standard 3-year pediatric cardiology training. Fellows are expected to participate in the quality improvement process by attending quality assurance meetings and mortality and morbidity conferences. They also need to initiate or complete one quality improvement project during their core training. Training programs need to monitor and mentor fellows carefully to ensure that their goals are achieved. Towards the end of fellowship training, an “Acting Attending” month is commonly held as a final test, during which fellows lead the inpatient services under the guidance of the faculty. An ongoing evaluation process with documentation of each fellow’s competence is critical. The goals and objectives of each rotation must be written and serve as the basis for formative feedback. The responsible faculty should meet the fellows at the start, midway, and at the end of each rotation. Emphasis should be given on evaluation of competency in preparation, performance, and interpretation of the results of a procedure, not on the number of procedures performed. The feedback process should allow arrangement of remedial actions if a fellow is not progressing as expected after enough procedures are performed for adequate assessment. Maintenance of Certification is the next required step after passing the initial certifying examination (Fig. 1) and is divided into four parts to promote lifelong learning and self-assessment that will enable physicians to continuously improve their knowledge and clinical performance. Part 1 is professional standing, which requires physicians to have an unrestricted medical license. Parts 2 and 4 are called the activities/points cycles, which need to be completed every five years. Part 2 is a lifelong learning and self-assessment that focuses on enhancement of knowledge relevant to the individual’s practice. It can be accomplished through a variety of activities that are available on the ABP website including knowledge self-assessment, decision skills, subspecialty self-assessment, and the question of the week. Part 4 entails improvement of professional practice by participating in collaborative projects and web-based activities for quality improvement. Finally, Part 3 is the exam cycle, which requires passing the recertification examination every 10 years. This dashboard shows the status of parts 2, 3 and 4. (1) For example, author DK has a current MOC cycle from 07/21/2015 to 12/16/2021. (2) The required and collected points for parts 2 and 4 are usually shown. In this case, the collected points are not shown because the author just completed the previous MOC cycle in 2015. (3) Part 3, the exam cycle, shows that the author will maintain his certifications in both Pediatrics and Pediatric Cardiology until 2020 and 2024, respectively. 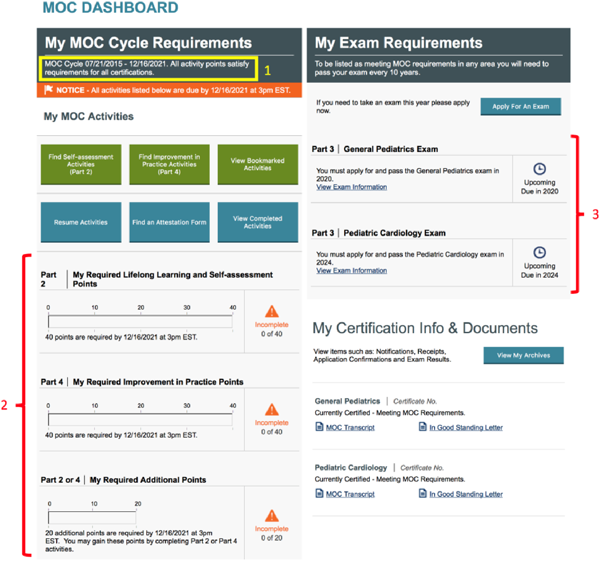 MOC, maintenance of certification. There are two major courses for pediatric cardiology board preparation in the United States. The Specialty Review in Pediatric Cardiology takes place in Chicago, IL and is organized by the American Academy of Pediatrics, Section on Cardiology & Cardiac Surgery in collaboration with the SPCTPD. The other is the Pediatric and Adult Congenital Cardiology Review course, which is organized by the Mayo Clinic and takes places in Dana Point, CA. Both courses are five to six days long and include an intensive board review with practice questions and answer sessions under the guidance of distinguished faculty. In 2016, the American Academy of Pediatrics started the Pediatrics Review and Education Program in Cardiology, which is an annual online subscription for a self-assessment program that delivers a total of 72 (18 per quarter) peer-review questions and critiques, with references linked to the ABP subspecialty content outline. At present, the only subspecialty board available in pediatric cardiology is the Adult Congenital Heart Disease certification, which has been offered by the American Board of Internal Medicine since 2015. The number of pediatric cardiology trainees the United States has more than doubled over the last decade, with 141 positions in the 2015 match, compared with only 61 positions in 2004. 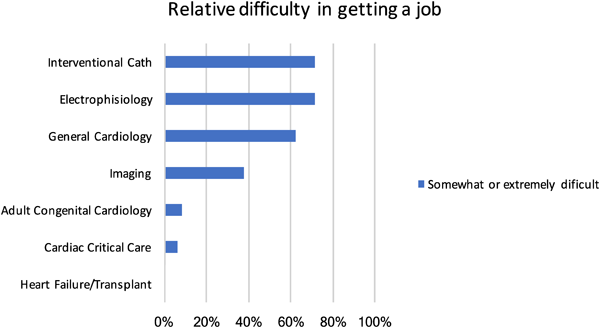 Recently, it seems that graduating fellows have faced more challenges in finding job positions in their area of subspecialty after completion of training. This situation has raised concerns on the possibility of an oversupply of pediatric cardiologists in certain subspecialties. To address this issue, a survey on the current training and employment patterns was conducted in 2015. Of 2,897 pediatric cardiologists contacted, a total of 823 (28%) completed the survey but with a high response rate from fellowship program directors (87%) and division chiefs (71%). According to the results of the survey, more than half of the fellows (140/237, 59%) pursued additional subspecialty training after completion of the 3-year core training program. Of the remaining 97 graduates who accepted positions right after three years of fellowship, 51 went into an academic position while 46 joined private practice. The most difficult subspecialties to find positions in were cardiac catheterization, electrophysiology, and general cardiology (Fig. 2); whereas the easiest fields were critical care cardiology, heart failure/transplant, and adult congenital cardiology. Based on the responses from the division chiefs, the anticipated annual job openings over the next two years will be 135 per year, compared with the 141 positions for fellowship matching every year. In addition, these graduates will be competing for vacant positions with established faculty changing institutions. The authors concluded that training programs should not increase fellowship positions at this time and that the survey should be repeated every two years to keep the field abreast of changes in training needs. The SPCTPD is a non-profit organization that comprises all pediatric cardiology fellowship directors. It was founded in 1999 to promote, maintain, and pursue excellence in the training of pediatric cardiologists. The SPCTPD website (spctpd.com) provides a periodic update on fellowship training opportunities. Although the positions for general pediatric cardiology fellowship are obtained through the National Resident Matching Program, a fourth year subspecialty fellowship position, which is sometimes hard to find, has been individually negotiated between programs and applicants. Importantly, the SPCTPD is now providing information on fourth year fellowship positions. Incidentally, author RR was a past president of the SPCTPD and played key roles in the 2015 workforce assessment and training guidelines update. Our institution is a free-standing children’s hospital that is affiliated with a large urban medical school. The pediatric cardiology fellowship started in 1991 and has grown into a medium to large-sized program in the United States. The faculty consists of 2 pediatric cardiovascular surgeons, 17 pediatric cardiologists, 2 nurse practitioners, and 9 fellows (3 per each year of training). Our program offers all the subspecialty services, including heart transplant and adult congenital heart disease. Over the last 26 years, author RR has been the fellowship director of pediatric cardiology in CHM. Author DK completed the 3-year core pediatric cardiology fellowship in 2010–2013 and the fourth year advanced fellowship in interventional catheterization in 2013–2014; currently, he works as a staff cardiologist and participates in fellowship education. The fellowship program curriculum of CHM was designed to provide maximum exposure to all aspects of cardiology and facilitate development of clinical competency and skills in research. Each rotation is a 4-week block, or 13 blocks per year (Table 3). First year fellows have a busy training schedule that focuses heavily on clinical medicine. At the beginning of fellowship, our new first year fellows attend an “echo boot camp” to introduce them to basic knowledge and skills related to transthoracic echocardiography. The first year of training includes three blocks of cardiac catheterization and echocardiography, two blocks of inpatient service, two blocks of protected research, one block of exercise stress laboratory/cardiac magnetic resonance imaging (MRI), one block of cardiovascular surgery, and one block of inpatient/transplant service. The succeeding second and third years of training can be tailored based on each fellow’s interests and skills, but in general, the second year includes two blocks of cardiac catheterization and echocardiography; one block each of inpatient service, exercise stress laboratory/cardiac MRI, cardiovascular surgery, and inpatient/transplant service; and five blocks of protected research time. The third year fellows spend up to seven blocks of dedicated research time, with the remaining time spent for inpatient/transplant service, inpatient “Acting Attending” service, cardiac catheterization, echocardiography, adult congenital heart disease, and exercise stress laboratory/cardiac MRI. Echo, echocardiography; Cath, cardiac catheterization; MRI, magnetic resonance imaging; CV, cardiovascular; ACHD, adult congenital heart disease. There are two important committees that monitor the fellows’ performance. The clinical competency committee (CCC) meets at least semi-annually to make a consensus decision on the progress of each fellow by review and discussion of performance evaluations based on the expected milestones. The CCC generates a report to the program director and serves as an early warning system for fellows who fail to meet the expected goals. The research scholarship oversight committee (SOC) assists fellows in designing, conducting, and assesses their likelihood of completing their research projects during training. These committee are responsible for determining satisfactory attainment of the goals and objectives of the training program, which will enable the fellows to complete their training and be eligible to sit for the pediatric cardiology board examination. In addition, every quarter, the program director personally meets with the fellows to discuss their performance, needs, and future plans, such as advanced training and job positions. The program director reviews each fellow’s individual learning plan to ensure that goals are being met and that strategies are in place in order to overcome any obstacles. Throughout fellowship training, fellows are mandated to attend a wide variety of educational lectures (Table 4). Regardless of rotations, fellows should be allowed to excuse themselves from clinical duty to be able to attend the educational activities. The importance of fellow participation should be stressed and the culture of education as a priority should be fostered. Every morning at 7:30 a.m. to 8:30 a.m., didactic lectures are given by faculty members or by the fellows themselves, or fellows take turns reading unknown cases of echocardiograms, angiograms, or electrocardiograms. Every Monday morning, the faculty give 1-hour lectures on specific topics, including cardiac catheterization, electrophysiology, heart transplant, exercise physiology, cardiac MRI, and pulmonary hypertension. On the last Monday of each month, inpatient and catheterization fellows present an interesting case that they have encountered during their rotations, followed by active discussion with the faculty. Pathology review takes place once a month and involves the fellows examining stored gross specimens of congenital heart disease under the guidance of the faculty. On Tuesday mornings, fellows engage in different types of activities every week including presenting their research projects and meeting with the SOC. Here, the fellows discuss the progress of their research projects and the SOC members provides constructive advice to help fellows proceed with their research successfully. SOC, scholarship oversight committee; EKG, electrocardiogram; conf, conference; Angio, angiography; Echo, echocardiography. A core lecture is held monthly and includes in-depth presentation by the fellows and faculty members on various contemporary topics, such as hyperlipidemia, cardiac embryology, extracorporeal mechanical oxygenation/ ventricular-assisted devices, and prosthetic heart valves. A journal club takes place once a month and requires fellows to discuss an article of interest using a standard evidence-based appraisal. Every Tuesday afternoon, there is a surgical conference wherein cardiologists and cardiovascular surgeons discuss and make recommendations on the management of each presented case. This conference is important not only for our clinical service, but also for the education of the fellows. All the clinical information and pertinent imaging findings (e.g., catheterization, echocardiography, and/or computed tomography or MRI) are carefully reviewed in order to come up with a treatment strategy that is evidence-based. Fellows are responsible for presenting each case in a concise and satisfactory manner. On Wednesday mornings twice a month, echocardiography lectures on specific cardiac pathologies are given by the imaging faculty. For the other weeks, one fellow in the echocardiography rotation is tasked to read the images without knowing the diagnosis in front of all the other fellows and the faculty; this session aims to evaluate a fellow’s knowledge and ability to read echocardiography as well as to teach pertinent echocardiographic issues. On Thursday mornings, an angiography conference is held by the fellows and the catheterization faculty to discuss angiographic imaging; this activity allows fellows to improve their interpretation of angiography along with understanding of hemodynamic data. Every other week, an echocardiography attending spends time in reviewing the images with the fellows. In this session, fellows are given technical advice on how to better acquire echocardiography images. On 2 Friday mornings a month, the fellows discuss among themselves and under faculty supervision certain topics in the ABP pediatric cardiology content outline; this board review session is a preparation for the pediatric cardiology board examination. Every 12:00 p.m. on Wednesdays, a series of unique research and education seminars occur that target all 52 subspecialty fellows of the nine pediatric fellowship programs at CHM. All these fellows attend this seminar series to learn topics that are common to all subspecialties. On the first and third Wednesdays of the month, fellows are given didactic lectures on medical statistics, institutional review board applications, grant and manuscript writing, and poster and oral presentations. Other topics covered by the seminar series include newer areas of emphasis by the ACGME, such as teaching skills and trainee health and safety issues, including the need for adequate sleep and quality improvement initiatives. On the second Wednesday of the month, a faculty member shares his/her experiences on research to serves as a role model for research at the next level. On the fourth Wednesday of the month, fellows present their research and receive input from experts from a wide array of subspecialties. Fellow’s research is supported by a generous internal grant from the CHM foundation. Fellows can apply for a maximum of USD 3,000 per project per year. When the project is accepted for presentation at a national conference, the fellow can apply for a maximum of USD 1,500 as travel fund from the same endowment. Our cardiology fellows take in-house calls, which require on-call fellows to stay overnight in the hospital. The in-service attending physician works with the on-call fellows to provide overnight coverage of the cardiology service. The cardiology fellows have on-call duties an average of once every nine nights. During the on-call service from 5 p.m. to 7 a.m., the on-call fellow is responsible for all inpatient cardiology care, new consultations, and urgent echocardiography procedures. The next day, the on-call fellow attends the morning lecture before signing out and leaving the hospital. Fellows are allowed four weeks of vacation every year. The training guidelines for pediatric cardiology in the United States have been recently revised to improve the educational experience and the evaluation process. With increased complexity in pediatric cardiology subspecialties, advanced training has become more common. As pediatric cardiology has become a highly competitive field, constant programmatic improvement is needed to insure fellows graduate with the required knowledge and skills to succeed.